Bryce Canyon National Park. At the confluence of Interstate 70 and Interstate 15. 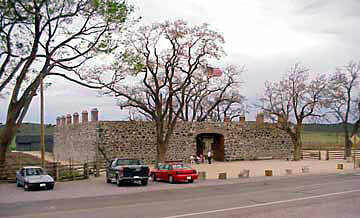 Cove Fort is located immediately northeast of the junction of I-15 and I-70, in the southeast corner of Millard County, twenty miles south of Kanosh and twenty-four miles north of Beaver. The fort was built to offer protection and refreshment to the traveler. Beginning in 1847, pioneers began settling the high mountain valleys stretching from Idaho to California. They came here to worship in peace and to build homes and communities. The fort is made of lava rock, which workers hauled from west of the property. The fort is 100 square feet, 18.5 feet tall, 4 feet thick at the footings and 2.5 feet thick at the top. In 1867, the prophet Brigham Young called Ira Hinckley and his family to come and direct the building and operations of the fort. Cove Fort has been restored to bring the past a little bit more to life. 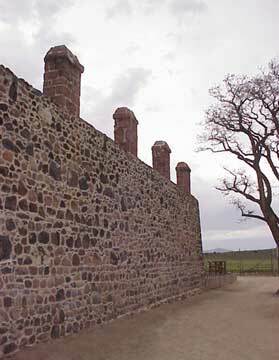 This is the only fort built by the Latter-day Saints in the 1800's that still stands.